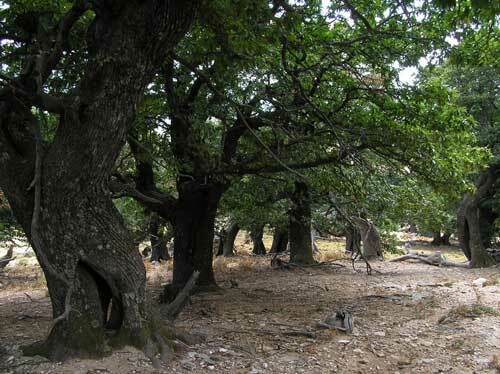 The Governmental Administration of Thessalia and Central Greece rejected the objections of ΣΠΠΕΝΚ, against the opening of roads and fire-proof forest zones in Kastanolongos chestnut forest, allegedly for re-forestation, from the company that destroys Ochi day-by-day. (Read detailed report here ). The company has been given full authority to intervene in Kastanolongos, opening two roads from Aghios Mamas to Kastanolongos and four fire-proof forest zones. Concerning the re-forestation, nobody knows if the young trees will be native species or irrelevant species (to the local environment) and they also don't inform how they will deal with the grazing: will they drive away the sheperds, or will they use a fence? We are experiencing the darkest moments of our homeland. The (wind-turbine) companies, having full cover from the Administration, are destroying at a fast pace the primordial nature of our homeland. The natives are pushed away from their fathers' land and the local country is progressing toward complete disintegration. We are experiencing the beginning of a destruction which has not taken place before. Only the local inhabitants can stop this, given they have started sensing the threat. The large number of wind-turbines that is about to be installed in S. Karystia will become it's gravestone, if we don't do anything to stop them. There is an imperative need to mobilize all together, as long as there is still time to save whatever is still possible to be saved!